Cytochrome P4502C8 (abbreviated CYP2C8), a member of the cytochrome P450 mixed-function oxidase system, is involved in the metabolism of xenobiotics in the body. 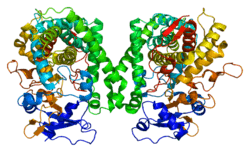 Cytochrome P4502C8 also possesses epoxygenase activity, i.e. it metabolizes long-chain polyunsaturated fatty acids, e.g. arachidonic acid, eicosapentaenoic acid, docosahexaenoic acid, and Linoleic acid to their biologically active epoxides. Following is a table of selected substrates, inducers and inhibitors of 2C8. Strong inhibitor being one that causes at least a five-fold increase in the plasma AUC values, or more than 80% decrease in clearance. Moderate inhibitor being one that causes at least a two-fold increase in the plasma AUC values, or 50-80% decrease in clearance. Weak inhibitor being one that causes at least a 1.25-fold but less than two-fold increase in the plasma AUC values, or 20-50% decrease in clearance. Where classes of agents are listed, there may be exceptions within the class. CYP2C8 also possesses epoxygenase activitiy: it is one of the principal enzymes responsible for attacking various long-chain polyunsaturated fatty acids at their double (i.e. alkene) bonds to form epoxide products that act as signaling agents. It metabolizes: 1) arachidonic acid to various epoxyeicosatrienoic acids (also termed EETs); 2) linoleic acid to 9,10-epoxy octadecaenoic acids (also termed vernolic acid, linoleic acid 9:10-oxide, or leukotoxin) and 12,13-epoxy-octadecaenoic (also termed coronaric acid, linoleic acid 12,13-oxide, or isoleukotoxin); 3) docosohexaenoic acid to various epoxydocosapentaenoic acids (also termed EDPs); and 4) eicosapentaenoic acid to various epoxyeicosatetraenoic acids (also termed EEQs). Along with CYP2C8, CYP2C9, CYP2C19, CYP2J2, and possibly CYP2S1 are the main producers of EETs and, very likely, EEQs, EDPs, and the epoxides of linoleic acid. ↑ "Diseases that are genetically associated with CYP2C8 view/edit references on wikidata". ↑ "Drugs that physically interact with Cytochrome P450 2C8 view/edit references on wikidata". ↑ Westphal C, Konkel A, Schunck WH (Nov 2011). "CYP-eicosanoids--a new link between omega-3 fatty acids and cardiac disease?". Prostaglandins & Other Lipid Mediators. 96 (1-4): 99–108. doi:10.1016/j.prostaglandins.2011.09.001. PMID 21945326. ↑ Chapter 26 in: Rod Flower; Humphrey P. Rang; Maureen M. Dale; Ritter, James M. (2007). Rang & Dale's pharmacology. Edinburgh: Churchill Livingstone. ISBN 0-443-06911-5. ↑ Fleming I (October 2014). "The pharmacology of the cytochrome P450 epoxygenase/soluble epoxide hydrolase axis in the vasculature and cardiovascular disease". Pharmacological Reviews. 66 (4): 1106–40. doi:10.1124/pr.113.007781. PMID 25244930. ↑ Wagner K, Vito S, Inceoglu B, Hammock BD (October 2014). "The role of long chain fatty acids and their epoxide metabolites in nociceptive signaling". Prostaglandins & Other Lipid Mediators. 113-115: 2–12. doi:10.1016/j.prostaglandins.2014.09.001. PMC 4254344 . PMID 25240260. ↑ Fischer R, Konkel A, Mehling H, Blossey K, Gapelyuk A, Wessel N, von Schacky C, Dechend R, Muller DN, Rothe M, Luft FC, Weylandt K, Schunck WH (March 2014). "Dietary omega-3 fatty acids modulate the eicosanoid profile in man primarily via the CYP-epoxygenase pathway". Journal of Lipid Research. 55 (6): 1150–1164. doi:10.1194/jlr.M047357. PMC 4031946 . PMID 24634501. ↑ Spector AA, Kim HY (April 2015). "Cytochrome P450 epoxygenase pathway of polyunsaturated fatty acid metabolism". Biochimica et Biophysica Acta. 1851 (4): 356–65. doi:10.1016/j.bbalip.2014.07.020. PMC 4314516 . PMID 25093613. ↑ Shahabi P, Siest G, Meyer UA, Visvikis-Siest S (November 2014). "Human cytochrome P450 epoxygenases: variability in expression and role in inflammation-related disorders". Pharmacology & Therapeutics. 144 (2): 134–61. doi:10.1016/j.pharmthera.2014.05.011. PMID 24882266. Goldstein JA, de Morais SM (Dec 1994). "Biochemistry and molecular biology of the human CYP2C subfamily". Pharmacogenetics. 4 (6): 285–99. doi:10.1097/00008571-199412000-00001. PMID 7704034. Smith G, Stubbins MJ, Harries LW, Wolf CR (Dec 1998). "Molecular genetics of the human cytochrome P450 monooxygenase superfamily". Xenobiotica. 28 (12): 1129–65. doi:10.1080/004982598238868. PMID 9890157. García-Martín E, Martínez C, Ladero JM, Agúndez JA (2007). "Interethnic and intraethnic variability of CYP2C8 and CYP2C9 polymorphisms in healthy individuals". Molecular Diagnosis & Therapy. 10 (1): 29–40. doi:10.1007/BF03256440. PMID 16646575. Ged C, Beaune P (Mar 1991). "Isolation of the human cytochrome P-450 IIC8 gene: multiple glucocorticoid responsive elements in the 5' region". Biochimica et Biophysica Acta. 1088 (3): 433–5. doi:10.1016/0167-4781(91)90138-c. PMID 1707679. Romkes M, Faletto MB, Blaisdell JA, Raucy JL, Goldstein JA (Apr 1991). "Cloning and expression of complementary DNAs for multiple members of the human cytochrome P450IIC subfamily". Biochemistry. 30 (13): 3247–55. doi:10.1021/bi00227a012. PMID 2009263. Kolyada AY (Sep 1990). "Sequence of a human liver cytochrome P-450 cDNA clone". Nucleic Acids Research. 18 (18): 5550. doi:10.1093/nar/18.18.5550. PMC 332242 . PMID 2216732. Shephard EA, Phillips IR, Santisteban I, Palmer CN, Povey S (Jan 1989). "Cloning, expression and chromosomal localization of a member of the human cytochrome P450IIC gene sub-family". Annals of Human Genetics. 53 (Pt 1): 23–31. doi:10.1111/j.1469-1809.1989.tb01119.x. PMID 2729895. Ged C, Umbenhauer DR, Bellew TM, Bork RW, Srivastava PK, Shinriki N, Lloyd RS, Guengerich FP (Sep 1988). "Characterization of cDNAs, mRNAs, and proteins related to human liver microsomal cytochrome P-450 (S)-mephenytoin 4'-hydroxylase". Biochemistry. 27 (18): 6929–40. doi:10.1021/bi00418a039. PMID 3196692. Okino ST, Quattrochi LC, Pendurthi UR, McBride OW, Tukey RH (Nov 1987). "Characterization of multiple human cytochrome P-450 1 cDNAs. The chromosomal localization of the gene and evidence for alternate RNA splicing". The Journal of Biological Chemistry. 262 (33): 16072–9. PMID 3500169. Kimura S, Pastewka J, Gelboin HV, Gonzalez FJ (Dec 1987). "cDNA and amino acid sequences of two members of the human P450IIC gene subfamily". Nucleic Acids Research. 15 (23): 10053–4. doi:10.1093/nar/15.23.10053. PMC 306558 . PMID 3697070. Zeldin DC, DuBois RN, Falck JR, Capdevila JH (Sep 1995). "Molecular cloning, expression and characterization of an endogenous human cytochrome P450 arachidonic acid epoxygenase isoform". Archives of Biochemistry and Biophysics. 322 (1): 76–86. doi:10.1006/abbi.1995.1438. PMID 7574697. Inoue K, Inazawa J, Suzuki Y, Shimada T, Yamazaki H, Guengerich FP, Abe T (Sep 1994). "Fluorescence in situ hybridization analysis of chromosomal localization of three human cytochrome P450 2C genes (CYP2C8, 2C9, and 2C10) at 10q24.1". The Japanese Journal of Human Genetics. 39 (3): 337–43. doi:10.1007/BF01874052. PMID 7841444. Gray IC, Nobile C, Muresu R, Ford S, Spurr NK (Jul 1995). "A 2.4-megabase physical map spanning the CYP2C gene cluster on chromosome 10q24". Genomics. 28 (2): 328–32. doi:10.1006/geno.1995.1149. PMID 8530044. Wormhoudt LW, Ploemen JH, de Waziers I, Commandeur JN, Beaune PH, van Bladeren PJ, Vermeulen NP (Sep 1996). "Inter-individual variability in the oxidation of 1,2-dibromoethane: use of heterologously expressed human cytochrome P450 and human liver microsomes". Chemico-Biological Interactions. 101 (3): 175–92. doi:10.1016/0009-2797(96)03723-4. PMID 8870687. McFayden MC, Melvin WT, Murray GI (Mar 1998). "Regional distribution of individual forms of cytochrome P450 mRNA in normal adult human brain". Biochemical Pharmacology. 55 (6): 825–30. doi:10.1016/S0006-2952(97)00516-9. PMID 9586955. Macé K, Bowman ED, Vautravers P, Shields PG, Harris CC, Pfeifer AM (May 1998). "Characterisation of xenobiotic-metabolising enzyme expression in human bronchial mucosa and peripheral lung tissues". European Journal of Cancer. 34 (6): 914–20. doi:10.1016/S0959-8049(98)00034-3. PMID 9797707. Klose TS, Blaisdell JA, Goldstein JA (1999). "Gene structure of CYP2C8 and extrahepatic distribution of the human CYP2Cs". Journal of Biochemical and Molecular Toxicology. 13 (6): 289–95. doi:10.1002/(SICI)1099-0461(1999)13:6<289::AID-JBT1>3.0.CO;2-N. PMID 10487415. Finta C, Zaphiropoulos PG (Feb 2000). "The human CYP2C locus: a prototype for intergenic and exon repetition splicing events". Genomics. 63 (3): 433–8. doi:10.1006/geno.1999.6063. PMID 10704292.